In rereading this issue, I was pleasantly surprised to find that it was more solid in both writing and art than I had remembered, which can be attributed to the fact that the entire creative team from editorial on down was in peak form by this point. True, the John Broome story that leads off the issue did resort to his “people doing things in another dimension that cause explosions in ours” trick, but he’s pretty much got it down by this point and the result is a taut and exciting tale. He even works the obligatory editor’s cover into the story in not only a seamless fashion this time, but he makes it an integral part go the story. The short recap is that a gang of thieves (described an an anti-social menace) in an adjoining dimension is employing a new type of explosive device during their crimes that also causes explosions in our dimension. When Kid Flash dives down one of the extra-dimensional explosion-caused rabbit holes in the ground, he ends up in the other dimension. He battles the gang and receives a glancing blow to the head which leaves him with delayed onset amnesia. There are some nice scenes referring back to Flash/Kid Flash shared adventures as the Flash tries to jog Wally’s memories (once again, you sensed that in these books some real care and thought was going into these stories). 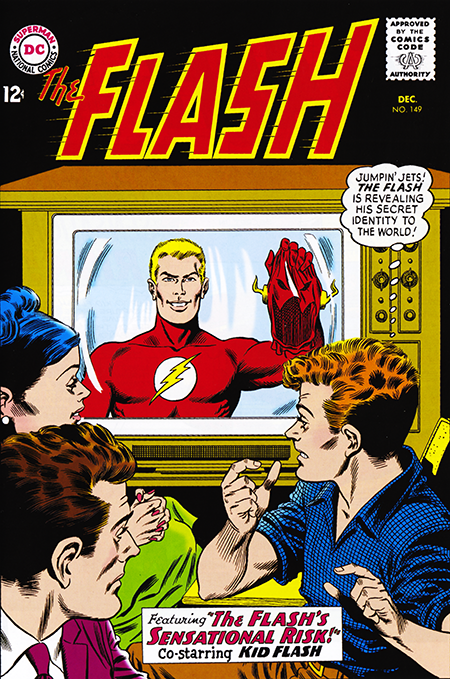 The Flash reveals his true identity on TV as a way to snap Kid Flash out of his amnesia and it works. Later the Flash reveals that it was done so fast that only the Kid with his enhanced abilities could see it. Clever. Then the two heroes vibrate to the other dimension to dispatch the gang. The second story, which was written by Gardner Fox, also employs some nice flashback (do you suppose that this is how the term flashback was coined? Sorry, couldn’t help that.) sequences as the Flash battles Abra Kadabra for the third time. The tale turns on the premise that AK wants to swap his magical powers for the Flash’s super speed, which, if allowed to stand, would have turned the book into Doctor Strange. At the story’s end, the Flash removes some magic that AK had transferred to him and places it in a lamp. I’m not sure if this dropped shoe is ever picked up again down the road, but it sure seems like a perfect set-up for a future adventure. I honestly don’t remember if it was or not, so we’ll both find out together as our forced march through the Silver Age Flash continues.